• Remove upper-deck seating in north end zone, decreasing capacity by 5,700. • New student section in south end zone. • Double-sided video board above the north end zone. • Video boards to show video and images to people outside stadium. • More concessions and bathrooms. 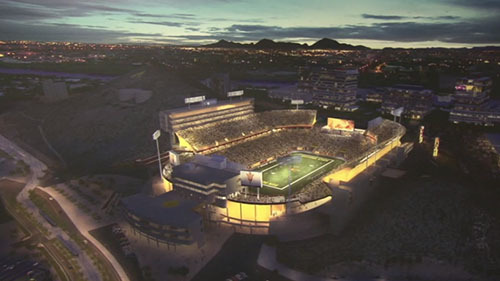 TEMPE ­– Arizona State University’s football coach and athletic director are pledging $500,000 a piece to help fund a $260 million renovation of Sun Devil Stadium. Appearing at a news conference Monday with their wives, Todd Graham and Ray Anderson said they want to lead by example as the university seeks funds for the project. Graham makes $2.3 million per year plus incentives. Anderson, who came to ASU in January after serving as the NFL’s executive vice president of football operations, has an annual salary of $600,000 plus incentives. The university has committed $210 million to the project and launched the Momentum Campaign in January to raise the remaining $50 million. In addition to seeking private donations, the campaign aims to identify new revenue streams to fund the renovation. The renovation plan includes a double-sided video board in the north end zone, a new student section in the south end zone, a new terrace pavillion, more restrooms and concessions, escalators connecting concourse levels and a new sound system. The biggest addition will be a video system that will project images and video onto the outside of the stadium. Work has already begun, upper-deck sections in the north end zone removed. The 56-year-old stadium was last renovated in 1988. The donations by Graham and Anderson are the largest ever given by athletic-department employees. 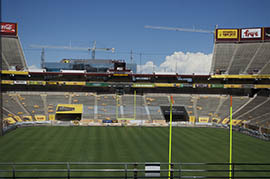 “I think it speaks volume of their personal commitment to what they do every day and it sends a tremendous message across the country to how emotionally involved they are with the success of what’s going on here at Arizona State University,” said Steve Butterfield, an alumnus and longtime supporter of Sun Devil Athletics who co-chairs of the Momentum Campaign. Anderson declined to say how much of the $50 million has been raised, adding that an announcement is planned in the next few days. 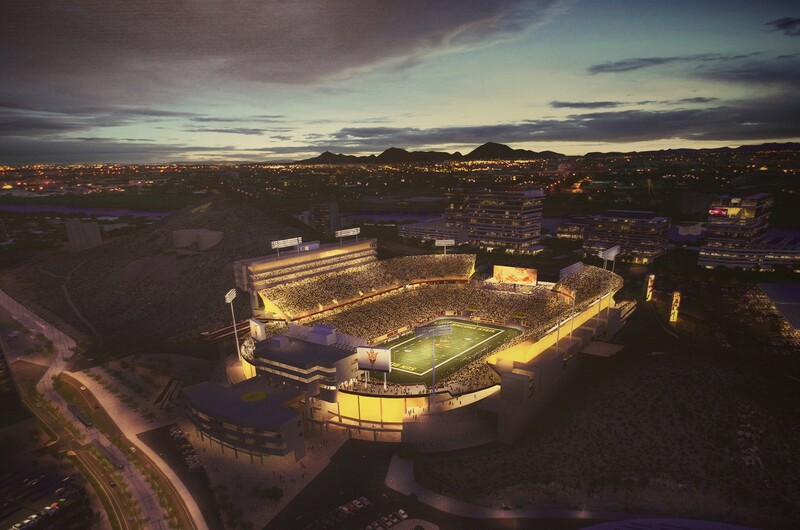 ASU Football Coach Todd Graham and Athletic Director Ray Anderson pledged $500,000 each to the Sun Devil Stadium project renovations. They believe this will drive more support to ASU athletics. Reporter Kari Osep gives us the details. From left: Ray Anderson, ASU vice president of athletics and athletic director; Buffie Anderson; Steve Butterfield, vice chairman of the Momentum Campaign; Penni Graham; and Todd Graham, ASU football coach. 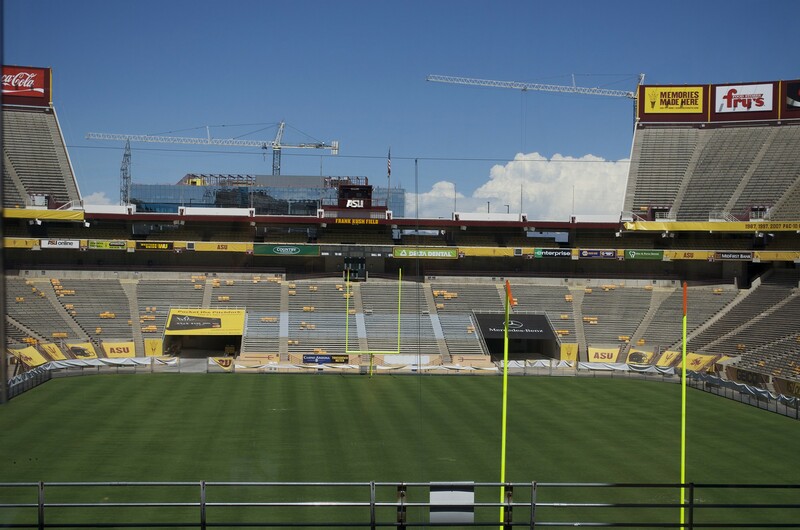 Upper-deck sections of Sun Devil Stadium's north end zone have already been removed as part of a $260 million renovation of the 56-year-old stadium. 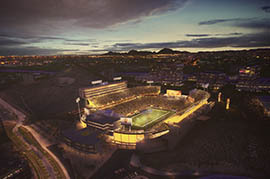 An artist's rendering of what the completed project will look like.